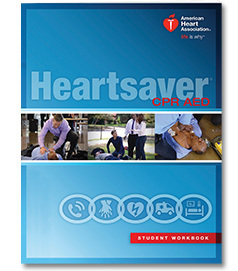 AHA’s Heartsaver CPR AED course provides the knowledge and skills that may help save a life for the most common life-threatening emergencies, covering how to recognize them, how to call for help, and how to perform lifesaving skills. Heartsaver courses from AHA offer: a cohesive, consistent experience for the learner, best practices to give students the best possible learning experience and help them better retain information, enhanced and realistic scenarios, while providing course and content flexibility. Heartsaver courses are intended for anyone with little or no medical training who needs a course completion card for job, regulatory (e.g., Personal Trainers), or other requirements. These courses can also be taken by anyone who wants to be prepared for an emergency in any setting.